Activision has released seven free-roaming Spider-Man games since 2004, each criticized for one particular flaw. Activision has released seven free-roaming Spider-Man games since 2004, each criticized for one particular flaw. Activision has released seven free-roaming Spider-Man games since 2004, each criticized for one particular flaw. What, doing the same thing over and over again isn't making this review any better? Weird. When Activision released the Treyarch-developed Spider-Man 2 in 2004, it was everything fans of Marvel Comics' most popular superhero could have asked for. Swinging between buildings in a massive model of New York City, battling iconic foes from Spidey's rogues gallery — it was exhilarating. So much so that the game's most glaring flaw, repetitive side missions, was given a pass. Since then we've seen the same problem in Ultimate Spider-Man, Spider-Man 3, Spider-Man: Friend or Foe, and Spider-Man: Web of Shadows. A ray of hope came when Beenox took over Spidey development duties. 2010's Shattered Dimensions set aside the open world formula in order to tell a series of contained stories, and was a breath of fresh air, despite the occasional glitch. The follow-up, Spider-Man: Edge of Time took the confined story idea a bit too far — Spider-Man (men, technically) spend the entire game confined to a single building — but at least there weren't any repetitive side missions. Perhaps Beenox was on to something here. Or maybe not. 2012's movie-based The Amazing Spider-Man took us back to the streets of New York City, land of the same handful of side popping up all over town. It was annoying, but fans were so overjoyed to be swinging through the skies again we cut the game some slack. Two years later and here we are again. Another open world Spider-Man game with repetitive side missions, and I've got absolutely no slack left to give. Activision's Spider-Man games have been receiving the same complaint for ten years now, and no seems to be able to address it. Maybe it's impossible to make a free-swinging Spider-Man video game without boring players to death with the same handful of staged fights, car chases, civilian rescues and races. Maybe Activision should stop trying until someone figures it out. But no, there's a major motion picture in theaters, so let's crank out another Spider-Man game. Throw in a number of nostalgia-tickling unlockable costumes, give gamers a taste of the style of web-slinging they've been wanting to see return since 2004's Spider-Man 2, and maybe they'll overlook the glaring problem one more time. The suits are rather nice though, each featuring its own set of enhanced stats that increase as the suit gains experience levels. As I streamed the game live earlier this week, several Twitch commenters said they were considering purchasing the game based on the costumes alone. I can't say I blame them — they're a fine addition to the established formula. The return of the fabled two-handed web-swinging caused quite a stir as well, though it's not quite a return to the series' finest moment. Spidey can cast a web to the left or right with the corresponding trigger button, but hitting both only controls acceleration. 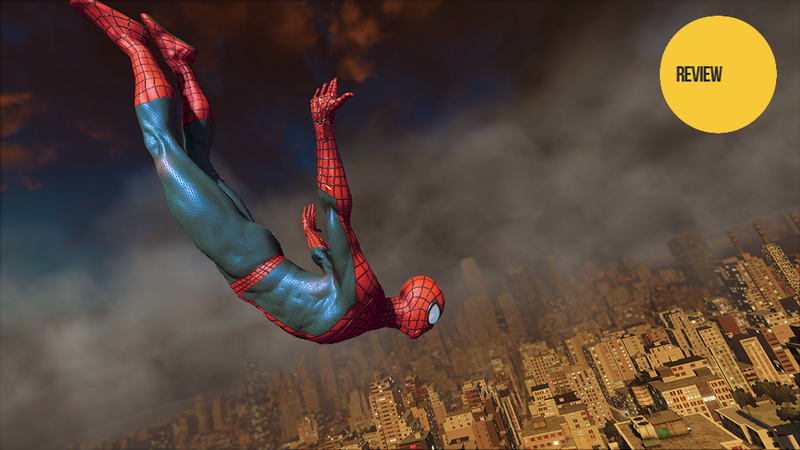 A complicated slingshot move can be unlocked, but it's practically useless in light of the return of the previous game's Web Rush mode, a much easier method of traversing NYC's skyline than simple swinging. Spidey must also make sure his webs have something to attach to — climb to high, and he'll take a dive, quipping "News flash: webs need something to attach to" or "web fail" or any of a handful of similar snippets. I found it obnoxious, as if the game were bragging about the mechanic. The fact that certain portions of the game revert to the old auto-swinging model only make it more annoying. While we're on the subject of annoying quips, Spider-Man really needs to learn when to shut the hell up. Nothing makes trying to forget about the game's many flaws more difficult than having the character repeat a reminder about his next mission every five minutes. I've not forgotten about Kraven or Harry or whatever — I'm just trying to find some enjoyment in an overwhelmingly average experience. It's not easy. It seems like every time I started to really have fun, Beenox would throw some sort of obstacle in my path. Take the game's story. It's essentially a "What If?" tale based on the The Amazing Spider-Man 2 film, mirroring some plot elements (Harry Osborn's plight, Electro's transformation) while weaving in fresh content (Kraven the Hunter's mentoring, the Kingpin's plot to take control of the city with Osborn's help). Gwen Stacy and Peter aren't together in the game, and not a single mention is made of Parker's stupid parents — in fact the game opens with a flashback to the shooting of Uncle Ben, a pivotal moment in Spider-Man's career. The great thing about this Peter Parker is that you believe it when he cries. It's an enjoyable story, but its high notes are punctuated by formulaic boss fights. The grand confrontation between Peter Parker and a major enemy arrives, and it's a complete letdown. Dodge, use a special power, attack and repeat. It's the same combat I'd been handing out to common thugs during the lead up to the major battle, only now the Black Cat randomly disappears, reappearing in another spot. Kraven, the mightiest hunter on the planet, takes a break from battle to hide in a tree. Another highlight is the ability to slip out of the suit and into the comfortable clothes of Peter Parker, using his investigative skills instead of his punchy, kicky ones. He's almost like Batman, only instead of Alfred he has his hideous Aunt May, looking like a slightly deflated Katie Homes. The ugly isn't limited to the outside, either. Bugs and glitches abound, from Spidey clipping into walls to erratic AI enemy behavior — at times I found myself standing right next to enemies that should have been viciously attacking me. They were not registering my presence at all. And of course, there are those repetitive side missions. For years, fans of the series and game critics alike have been complaining about being asked to endlessly battle the same series of thugs, rescue the same hostages, carry the same victims to the same hospitals and so on. That those complaints have gone unanswered for so long is a giant "screw them, they'll buy it anyway." Players deserve better. It's right there on the game's cover: "The AMAZING Spider-Man 2." Not "The Mediocre Spider-Man." Not "The Okay, But Could Use A Lot Of Polish Spider-Man" and certainly not "The Repetitive Spider-Man." At this point in the series' life, we should be playing a game that's as amazing, spectacular, sensational and superior as its main character.